A story about jobs, bachelors, bachelor's degrees -- and a very weird government definition of "home." Another month, another record number of young people living at home long after their teenage years are over. This time, it's the Wall Street Journal reporting that, despite the improved economy pulling unemployment down for the last three years, the share of young adults living with their parents is still rising. Still! More than a third of Americans between 18 and 31 are currently living with their parents, according to the Current Population Survey. Seriously. What's going on here, if it's not just the economy? We can begin to find the answers in the new mammoth Pew Research Report, released just this month, which found a record 21.6 million "Millennials" living at home. The answer boils down to three variables, which I'll sum up as: economics, bachelor's degrees, and bachelors. We have to start with economics. The share of young people living in the basement was basically unchanged for four decades before the recession. Then the recession hit, and millions of young people who would have otherwise had jobs didn't. Last year, Millennials without a job were 55 percent more likely to be living with their folks than employed young people. But when you look at the shift since 2007 in the graph below, something might seem funny to you. Sure, the recession figures are high, but pre-recession figures are high, too. One in two 18-24-year olds were living at home before the crash? And one in seven late-twentysomethings? 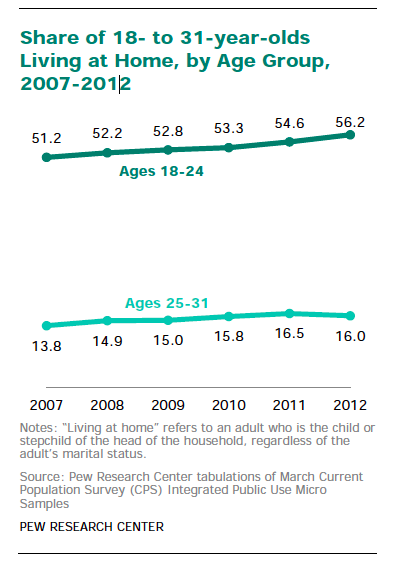 Why were so many young adults apparently living at home when unemployment was about 4 percent? It comes down to a very sneaky definition of "home." In the Current Population Survey that provides these figures, "college students in dormitories are counted as living in the parental home." Dormitories! This might strike you as absurd -- and it certainly strikes me as questionable -- but it's Labor Day Weekend, and I'm not going to waste it fighting with the folks at CPS, so there it is. Dorms = your parents' place, according to the government. This is a huge deal for the Millennials-living-at-home figures, because college enrollment increased significantly during the recession -- 39% of 18- to 24-year-olds were enrolled in college in 2012, compared with from 35% in 2007 -- and college enrollees are much more likely to be living at home (er, in dorms) than students who skip college, drop out, or finish early. So a huge part of the explanation for the ostensible boom of stay-at-home kids is actually good news: more bachelor's degrees. Finally: More bachelors. Unmarried young people are six-times more likely to be living at their parents' place than married couples (understandably). In the last 50 years, the share of twentysomethings who are married utterly collapsed before 2007. The recession made marriage even less attractive to many young people. Higher unemployment, more people going to college, and more single people explain most of the change. But research found that there was even an increase within all three groups, as well. Maybe they were all affecting each other. Or perhaps a fourth factor -- general unease about the future? a gradual normalization of twentysomethings living with their parents? -- is at play. But the most important takeaway is that, although the Great Recession was nothing but a tragedy, the rise in young people living at home isn't quite as tragic. It's partially a reflection of more young people going to school and saving money before starting a family of their own.